Your aging parent or grandparent spent many years taking care of you, so when the time comes for them to need in-home care, it’s natural that you might consider moving them into your apartment. There are some steps you should take first to make your home safe for your loved one. Keep in mind that they might not be walking as well as they used to; their vision and hearing might also not be as sharp as it once was. With patience and attention to detail, you can make your apartment a welcoming place for your relative without putting them at risk for injury. One in four senior citizens over the age of 65 falls annually. In fact, there’s even a chance that your loved one is moving in with you because they fell and were injured. Your most important priority in most cases is to prevent your relative from falling. Walk through your home and look carefully at the floors. Are there any loose throw rugs? Any cords along the floor that could be tripped on? Do you have to step down into your living room or a converted garage? All of these are potential hazards. Pick up the throw rugs and move the cords. Warn your relative about any steps that they might not expect. Install grab bars in the bathroom that your loved one will be using. Bars near the toilet and in the shower will help them gain their footing if they should start to lose their balance in the bathroom. Be sure that the shower has a textured bottom to prevent slipping and that the bathmat is absorbent and has a non-skid bottom. If your loved one has a walking aid, encourage them to use it. Many seniors don’t want to use canes or a walker, but the alternative could be a nasty fall. Talk to your relative’s doctor or physical therapist if you’re having a hard time getting them to use their aids; sometimes a word from a medical professional carries more weight. Even if your loved one isn’t suffering from Alzheimer’s disease or some other form of dementia, it’s not uncommon for seniors to get temporarily confused in new surroundings. Leave a light on in the bathroom and a few night-lights around the house, particularly the first few weeks that they are with you. If your relative tends to wander, you’ll need to take some extra precautions. First, be sure to place an alert bracelet on his or her wrist; this way, if they do get out, someone will know who to call and that they have dementia. Consider a location device, too, that you can keep on the bracelet or on a shoe. You might need to install a sliding bolt at the top of your doors leading outside. Using child-proof doorknob covers can discourage someone with limited dexterity from opening the door. So can using black tape to make a wide black stripe across the floor in front of the door (if your loved one has limited vision, it can create the illusion of a gap which they might not want to cross). If your relative has dementia or confusion, it’s important to educate yourself. Check out this list of dementia books and speak to your loved one’s doctor about ways to keep him or her safe. Your loved one might be prone to burns both because they have thinner skin than they once did and because they might not have the dexterity or quick reflexes to dodge hot water or spit out hot food. Turn your water heater’s thermostat down to 120 degrees to prevent scalds. If your loved one still likes to cook, keep an eye on them. Encourage them to wear snug-fitting clothing for cooking; ask them to remove any draping sweaters or other loose clothing that could catch fire. Also, be sure to lend a hand if they need it for draining the water from boiling pasta or other potentially hazardous tasks. Chances are good that your elderly relative is taking some prescription medications. Get a list of all prescription, over-the-counter, and herbal medications that they’re taking and check with a pharmacist to be sure that there are no contraindications. Separate the pills into a weekly pill box and watch to make sure they’re taking the medications as directed. You might need to administer the medications, keeping the rest in child-proof containers (which are also usually difficult for senior citizens to open). 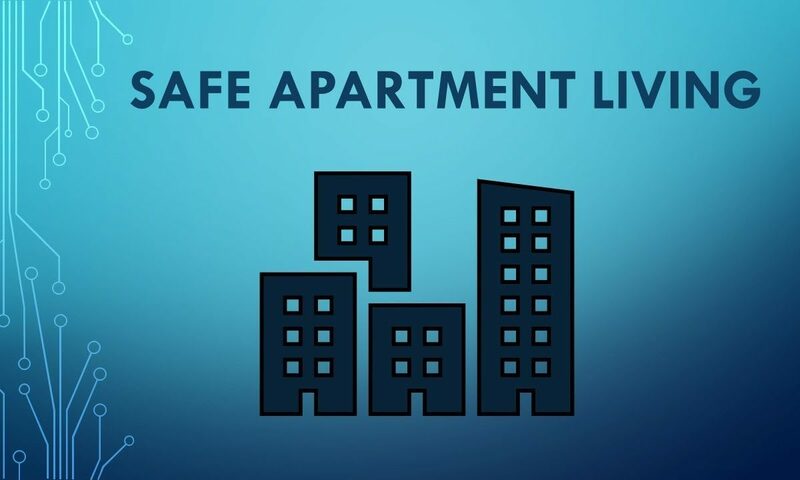 Keeping your loved one safe in your apartment takes some attention to detail and planning, but it can be done. Ask a home health nurse or another professional to visit your home for a walk-through before you move your relative in permanently so you can be sure you’ve covered all of your bases.